Welcome home. Charming single story home in East Highland Ranch. Cul-de sac location offers ample privacy. Features 3 bedrooms and 2 full bathrooms. A refreshing open floor plan welcomes you to the spacious living room with a cozy fireplace which extends to the spacious kitchen. 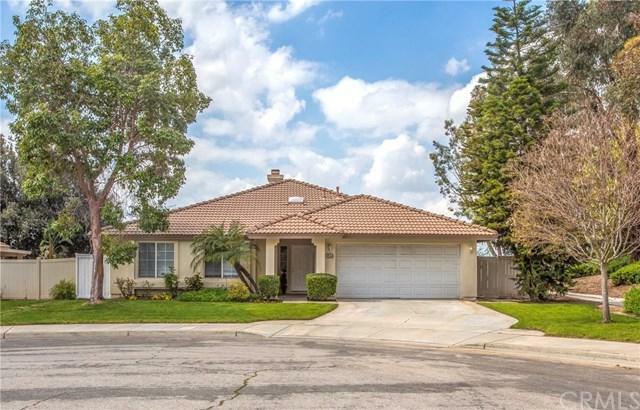 Well maintained tile flooring and new vinyl planks throughout make this home easy to maintain. Ceiling fan in living room and master bedroom add comfort in upcoming summer. New renovations/ upgrades include: stainless steel refrigerator, gas range, recessed lights in kitchen, bathrooms+GG shower, fixtures, tub, sink, vanity, lights, vinyl planks throughout, custom color interior paint, custom fitted blinds, newly reinforced patio roof, indoor and outdoor lighting, new smoke detectors and carbon monoxide monitor and spruced up landscaping front and back.Backyard features lattice covered concrete patios. Well maintained white painted wood panel fence secure this home. Easy access to East Highland Ranch amenities: Olympic sz pools, club houses, park, huge lake, playground and sport courts, easy access to a main street, city amenities, shopping and freeway. Redlands school district. Call now!